There's a lot of movies I know almost nothing about save for the cars in them. Mid-century French cinema is not something I'll pretend to be an expert on, but man, do they have some great traffic sequences. 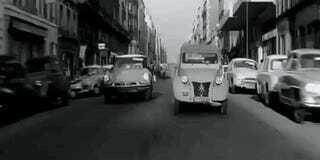 And this one, from the 1961 movie la Bride Sur le Cou has one of the best awful driving sequences I've ever seen. It certainly doesn't hurt that Bardot is eye-searingly lovely behind the wheel of that fearless 2CV, of course. You also have to really give credit to those stunt drivers who had to have had gonads made of tempered steel to do this sort of thing at the scales and with all the traffic and chaos you see here.